The first Rector, who was also Dean of the Faculty of Arts, was Laurence of Lindores. He was a scholar of some standing since his commentary on Aristotle's Physics was used in many centres of learning in Europe. Laurence of Lindores was a Nominalist. This means that he believed that the existence of a word describing a property of a set of objects did not mean that there were any objects satisfying this property. The opposing camp consisted of the Realists whose views were based on those of Plato and Aristotle. Albertus had written a Realist commentary on Aristotle which was widely used but the Faculty of Arts in St Andrews banned Albertus's book in 1418. Little of originality came out of the first 200 years of the University, in fact 250 years was to pass before mathematical research was to flourish. The 4 year degree in Arts in the 15th Century took in pupils of 13 years of age and their main study was Aristotle. His works on Logic, Physics and Natural Philosophy and Metaphysics were studied in the second, third and fourth years respectively. John Maior, renowned for his work in philosophy, logic and in particular on infinity, lectured in theology at St Andrews from 1531 until 1534 when he became the Provost of St Salvator's, a post he held until his death at the age of 80 in 1550. Napier entered the University of St Andrews in 1563 at the age of 13. However although St Andrews gave him a versatile and international outlook he seems, like most students, to have learnt more about religion than mathematics at St Andrews. Reforms in 1574 meant that specific duties were allocated to professors in each college and a master in St Mary's College was to act as Professor of Mathematics. In 1579 further reforms, led by Andrew Melville a Protestant extremist, were brought in mainly with the motive of making the University a Presbyterian showpiece. For the first time professors with specialist subjects were appointed, and one of these was in mathematics, now attached to St Salvator's College and not to St Mary's College. Mathematical research at the University of St Andrews really began in 1668. Sir Robert Moray, a graduate of St Andrews and a founder member of the Royal Society, and the Archbishop of St Andrews James Sharp, influenced the king, Charles II, to found a Regius Chair of Mathematics at St Andrews. James Gregory, who had been elected a Fellow of the Royal Society on 11 June 1668 and was a friend of Moray, was appointed the first holder of the chair. Gregory was not attached to a College, as were the other professors, but given the Upper Hall of the university library as his place of work. The building of the library had begun in 1612 but the work was only completed in 1643. It was, at that time and for the next 200 years, the only university building which was not part of a college so in a sense the only possible place for an unattached professor. ...I am often troubled with great impertinences: all persons here being ignorant of these things to admiration. However Gregory was to carry out much important mathematical and astronomical work during his six years in the Regius chair. He kept in touch with current research by corresponding with John Collins. Gregory preserved all Collins' letters, writing notes of his own on the backs of Collins' letters. These are still preserved in the St Andrews University library and provide a vivid record of how one of the foremost mathematicians of his day made his discoveries. Collins sent Gregory Barrow's book and, within a month of receiving Barrow's book, Gregory was sending Collins results which would give him an excellent claim to be a co-inventor of the calculus. In February 1671 he discovered Taylor's theorem (not published by Taylor until 1715), and the theorem is contained in a letter sent to Collins on 15 February 1671. The notes Gregory made in discovering this result still exist written on the back of a letter sent to Gregory on 30 January 1671 by an Edinburgh bookseller. Collins wrote back to say that Newton had found a similar result and Gregory decided to wait until Newton had published before he went into print. Had he not been so modest Gregory would have attained even more fame! Let in the sun's rays by a small hole to a darkened house, and at the hole place a feather (the more delicate and white the better for this purpose), and it shall direct to a white wall or paper opposite to it a number of small circles and ovals (if I mistake them not) whereof one is somewhat white (to wit, the middle which is opposite the sun) and all the rest severally coloured. I would gladly hear Mr Newton's thoughts of it. 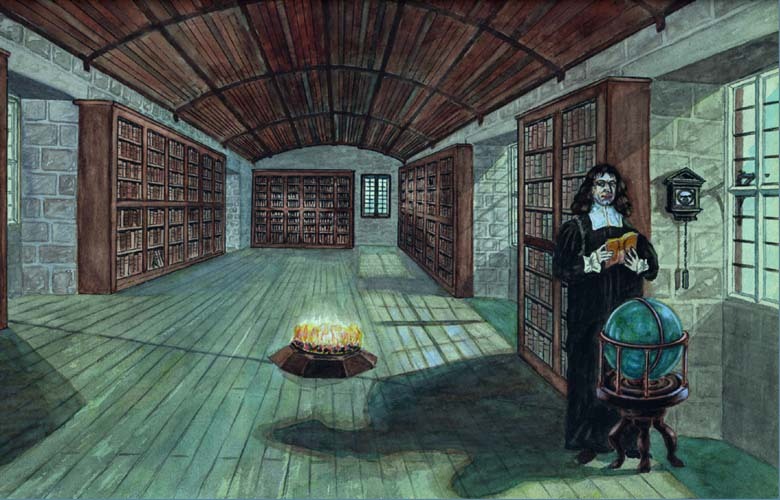 The Upper Room of the library had an unbroken view to the south and was an excellent site for Gregory to set up his telescope. A bracket on the wall beside a window, still with its adjustment screw, remains of where Gregory's telescope was set up. He drew a north/south line across the floor (the line was transferred to the present floor). He lined up his telescope on a wooden pillar he built on the ridge of a hill just over a mile to the south. Gregory hung his pendulum clock on the wall beside the same window. The clock, made by Joseph Knibb of London, was purchased in 1673 and originally hung on the library wall. A few years later it was made into a long-cased clock, in which form it remains today. It is important to realise what an early clock this is. 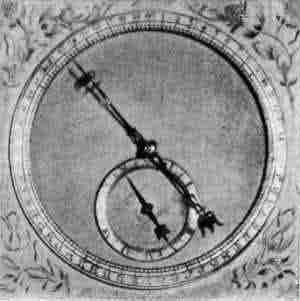 Huygens patented the idea of a pendulum clock in 1656 and his work describing the theory of the pendulum was published in 1673, the year Gregory purchased his clock. Here is the upper room of the library. Gregory's clock and its clockface. In 1674 Gregory cooperated with colleagues in Paris to make simultaneous observations of an eclipse of the moon and he was able to work out the longitude for the first time. However he had already begun work on an observatory. In 1673 the university allowed Gregory to purchase instruments for the observatory, but (things have not changed much!) told him he would have to make applications and organise collections for funds to build the observatory. In fact Gregory went home to Aberdeen and took a collection outside the church doors for money to build his observatory. On 19 July 1673 Gregory wrote to Flamsteed, the Astronomer Royal, asking for advice and contemplated using St Rule's tower for some of his instruments. St Rule's tower still stands among the ruins of the Cathedral in St Andrews and must look exactly as it did in Gregory's day. 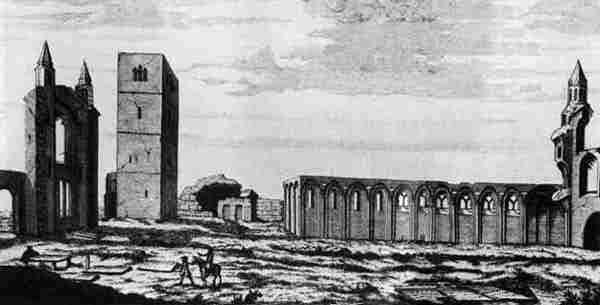 St Rules tower in about 1680 and St Rule's tower today. I was ashamed to answer, the affairs of the Observatory of St Andrews were in such a bad condition, the reason of which was, a prejudice the masters of the University did take at the mathematics, because some of their scholars, finding their courses and dictats opposed by what they had studied in the mathematics, did mock at their masters, and deride some of them publicly. After this, the servants of the colleges got orders not to wait on me at my observations: my salary was also kept back from me, and scholars of most eminent rank were violently kept from me, contrary to their own and their parents wills, the masters persuading them that their brains were not able to endure it. William Sanders was appointed to the Chair of Philosophy at St Andrews in 1672. He actively supported Gregory in his plans for the new Observatory and, when Gregory left for Edinburgh, Sanders was appointed in 1674 to the Regius Chair of Mathematics. Sanders, although in no way of Gregory's stature, was at least also a believer in the new scientific ideas as he demonstrated in a book published in in 1674. During his period as Regius Professor he also published The Elements of Geometry in 1686. Sanders resigned the Regius Chair in 1688 to become a schoolmaster in Dundee. It is unclear why he should have made such a move and it is equally unclear why James Fenton should have been appointed to the Chair in 1689. He is thought to have been a graduate of St Andrews but failed to bring distinction since he appears to have been sacked in 1690 and expelled from the University one year after being appointed. Whether there were then legal problems in filling the Regius Chair is unknown but it remained unfilled until 1707 after Fenton's death. great improvements made in late years in Natural Philosophy and Mathematics by means of experiments. New apparatus was specially bought for the course which was taught by Charles Gregory. The Senate, looking to bring in funds to help with the purchase of the apparatus, allowed subscribers to the apparatus fund to attend the experiments free of charge! The observatory set up by James Gregory was dismantled in 1736 and does not seem to have been used by Charles. Charles Gregory held the Regius Chair until his son was old enough to succeed him, which he did in 1739.